Jeff Jarvis challenges news organizations to define the role of editor in the 21st century, i.e. Editor 2.0. Jeff connects a number of dots that involve a significant, even radical shift in the traditional editorial role, such as new search/tag editor positions. But one of the most radical shifts taking place is that editors are now being asked to curate OTHER news organization’s content in addition to their own. In the age of limited, monopoly distribution, editors were able to focus exclusively on the product of their own newsrooms, because that was the only content their readers could get in most cases. Now that the web and search has made ALL content from EVERY source easily accessible, many media brands are realizing they can’t just be in the business of creating their own content — they need to bring their readers the ENTIRE universe of content on the web. A number of traditional media brands have already started curating content from other news organizations — these efforts typically employ a traditional, command-and-control, single editor model, but they nonetheless represent a sea change in the disposition of news organizations towards content produced inside their walls vs. content produced outside their walls. In a networked media world, no content brand can do it all by themselves — news consumers, empowered by search and news aggregators, know this, and that’s what’s driving news organizations to take this radical step. For example, BusinessWeek.com has launched a new feature called Executive Summary, which aggregates the top business stories of the day, mostly from sources OTHER THAN BusinessWeek. The Executive Summary is BusinessWeek’s daily roundup of the most important business news from around the Web. Edited by Chi-Chu Tschang, the early edition is posted every weekday by 6 a.m. Eastern Standard Time. An afternoon edition, edited by Harry Maurer, is available by 3 p.m. EST. ADN editors find the news from all over Alaska every morning so you don’t have to. Time.com has been publishing for a while now a blog called The Ag (short for the Aggregator), which takes a similar approach. BusinessWeek, Anchorage Daily, Time and many other news organizations have wisely realized that if they want to remain a principal daily destination for their readers, they need to do more than publish their own original content — there are too many other high quality content sources on the web — too many for news consumers to get their arms around. That’s why there’s a huge value creation opportunity for editors to curate ALL the news, not just what their own news organization can produce. That said, what these first brave forays into news aggregation miss is the opportunity to harness the power of the web, to extend the editorial reach and enhance the editorial intelligence by taking a networked approach rather than a traditional siloed approach. A single editor can only read a limited number of sources, and can only post the aggregation once a day. But imagine, instead, many editors and journalists collaborating to find and select the most important stories of the day. Image how many more sources they could cover. 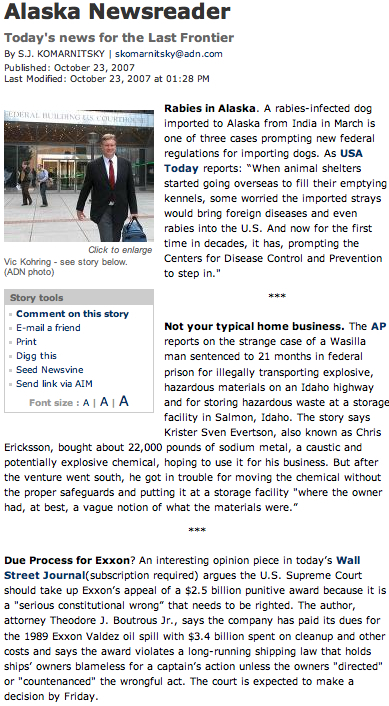 Imagine the news aggregation updated dynamically throughout the day. Imagine “the editor” as a powerful networked intelligence, bringing you ALL the news on the web.